Simon Goldsworthy set the pace for nearly 1,500 runners in the 35th Hendy Tunbridge Wells Half Marathon on a crisp, sunny Sunday morning (18 February). Simon (1:11:21) was only 18 seconds outside his PB, set at Woking last year, as Maria Heslop (Tonbridge, 1:22:25) recorded her fourth victory on this notoriously hilly course. Simon Goldsworthy quickly established a lead from the start outside Fusion Tunbridge Wells Sports Centre and headed for the hills that are such a feature of this challenging course. After an opening mile on the A26 through busy Southborough the route passes pretty villages like Bidborough and Penshurst before the 300 foot ascent of Spring Hill to Fordcombe. From here the runners visit Langton Green and Rusthall, with views from Mount Ephraim across High Rocks, before the welcome descent to the finish. Tunbridge Wells Harriers (TWH) have honed the event organisation over the years and provide pacers from 1:30 to 2:20 as well as free massage and a technical long sleeve top for all finishers. Although the temperature stayed in low single figures the sun shone and there was very little wind, so conditions were just about perfect. With the winner setting a brisk pace there were impressive times behind as local favourites Billy Hobbs (TWH, 1:12:44 PB) and former winner Julian Rendall (Tonbridge, 1:13:16) completed the podium. Maria Heslop completed a hat trick of consecutive wins, having also won in 2014. The W50 master was two seconds faster than last year and her time is among the top 10 UK all time in her new age group. Heslop was followed home by team mate and fellow W50 Tina Oldershaw (1:25:03), who is the most successful athlete at this event with five victories this century. Georgina Frost (Orpington RR, 1:27:11 PB) was third, improving her 2010 best at Hastings by an astonishing 10 minutes! More than 100 athletes broke 90 minutes and Graham Brooks of the host club had the honour of closing the race in 3:30:38 to head his category as the sole M80 finisher. Famed for the scenic and challenging route (the 300 foot ascent of Spring Hill at Fordcombe is to be mentioned), meticulous organisation, value for money and friendly marshals, it was voted the ‘Most Improved Race in the UK’ in 2009 and was voted the No.2 Half Marathon in the UK in 2011 by Runner’s World readers. It is one of the biggest events in the UK organised by a running club and Tunbridge Wells Harriers are very proud to have hosted the event for over 30 years. Over the last 5 years the race has also donated over £150,000 to charity and some worthy local causes directly from race surplus. We are hugely grateful to all of our sponsors and partners particularly this year to Hendy our sponsor for the 2018 event. Our race is organised by volunteers from Tunbridge Wells Harriers. We donate all our surplus to charity. This year we are supporting the Pickering Centre as our main charity, with The Bridge Trust and Tunbridge Wells Counselling Centre. Other local Charities we support are the TW CAB and Compaid, Any donations with your entry will be shared between the 3 headline charities. Thank you very much. For £28 (or £26 for England Athletics Affiliated Club Member) inclusive with entry fees, competitors will receive a technical fabric long sleeved running T-shirt, a bespoke medal, accurate chip timing, secure baggage facilities and entry admin fees. Below you can find details of the course, information for on the day, the prizes and trophies, last years report and the results. If you have any questions not answered in the sections below or the FAQ page, please contact us. The course is one of the most testing and picturesque on the racing calendar. The one lap circuit through some of the finest countryside in Kent includes a few notable hills, among which Spring Hill on the approach to Fordcombe should be mentioned in particular. There are drink stations on the route at 3, 5.4, 8, 9.5 11.3 miles and at the finish, and first aid. This race is UKA certified (Permit number 2014-10650). As this is a hilly course, we regret that it is not suitable for wheelchair athletes. Dogs or buggies will not be permitted, and athletes must not be accompanied or followed by others on cycles. This race is run under UKA Licence and therefore because it is run on shared roads head phones and ear pieces of any description are NOT ALLOWED. The wearing of headphones, or similar devices, (other than those medically prescribed), is not permitted in races on any single carriageway road that is not wholly closed to traffic. Bone conducting headsets are however permitted. Thanks to those who have questioned this. There will be signs with graded finish times positioned at the start. Please congregate in the section marked closest to your anticipated finish time in order to have a smooth start. Do not warm up on or cross the road – the start is in the bus lane on the same side of St John’s Road as the Race HQ, so there is no need to cross this very busy main road. Traffic management is in place for the duration of the race, but roads are not completely traffic free. Traffic will be stopped on the A26 for the start at 9am. At all other times, runners MUST observe the Highway Code and rules of the road. Please abide by the directions of the marshals around the course, but understand that marshals can only advise motorists and do not have powers to stop traffic, so exercise all reasonable road sense and caution when running on and crossing roads. When running on the road, please remain on the left hand half of the road unless directed otherwise by a marshal. A vehicle will follow the race and can pick up runners who wish to drop out. It will be clearly marked ‘Drop out runners’. If you wish to drop out please inform a marshal and await the vehicle. As above – runners are NOT ALLOWED personal headphones to listen to iPods, MP3 players, or other personal music players while participating in the race. Running whilst wearing headphones significantly reduces your ability to hear traffic, instructions and warnings from the police and marshals, and generally distracts your attention, increasing the risk of accident or injury to yourself and possibly other people. RULE 240 S 5 UKA SUPPLEMENT – HEADPHONES The wearing of headphones, or similar devices, (other than those medically prescribed), is not permitted in races on any single carriageway road that is not wholly closed to traffic. This is for your SAFETY. Please note bone conducting headsets however are permitted as these are not ‘in the ear’ devices. Pacers sponsored Tunbridge Wells Harriers, will be on hand to help you to your target time. Pacers will be for (gun time) 1:30, 1:40, (chip time) 1:50, 2:00, 2:10 and 2:20. Due to the hilly nature of the course, the pace will vary and won’t be on ‘minute mile’ pace. Using their knowledge of the course the pacers will aim to help you to your target time. Look out for the pacer back pack mounted flags on the day. Water will be provided in cups at five locations on the course at 3m, 5½m, 8m, 9½m and 11m, as well as at the finish. Due to the earlier start time of 09:00 imposed by Highways it is now not possible to travel by train to High Brooms or Tunbridge Wells to reach the start in time on race day. Tonbridge Station is approximately 3 miles away and it maybe possible to travel by train to here and then take a taxi to the start. However it is suggested you do not rely on trains to get you to the start on time. If you do however decide to travel by train please, check for engineering works or timetable changes at www.nationalrail.co.uk and plan your journey in advance. Arriva operate the bus service www.arrivabus.co.uk – ask for Tunbridge Wells Sports Centre or Territorial Army stop. Local parking is limited but there are several dedicated race carparks (see below map). Arrive in Tunbridge Wells in plenty of time – we advise at least 60-90 minutes before the race. Please park considerately and do not block roads or residents’ driveways. There is NO parking at HQ for runners. Plan ahead where you are going to park and car share where possible. There are numerous public car parks in Tunbridge Wells within a mile of HQ. There is a charge for car parking on Sundays so bring spare change. Allow plenty of time to park and walk to race HQ. Race HQ is the sports hall section of Fusion Tunbridge Wells Sports Centre, St John’s Road, Tunbridge Wells, Kent TN4 9TX. Only VIP Parking at Race HQ. Changing rooms, toilets and lockers (£1 coin required) are available at HQ but NO showers. There are additional toilets outside and at the race finish area. Race Expo in the Sports Hall from 7.30am – visit our sponsors and partners for discounts, offers and advice. The Running Hub shop will be available for any last minute items. Please note there will NOT be a Kids Activities morning in the sports centre for runners who have youngsters they would like occupied while they run the Half marathon this year. This is due to refurbishment work taking place in the Sports Centre. For 2019 number and T shirt collection will be from the Tunbridge Wells Sports Centre Entrance Foyer as 2018 from Thursday 14th February until Friday 15th February from 09:00 until 18:00, Saturday 16th from 09:00 to 17:00. Then on race day from the race HQ, (the main sports hall) from 07:00 till 08:30. The post code for both locations is the same TN4 9TX. Please note on Thursday until Saturday you will be able to park in the Sports Centre car park but on race day this will be closed to runners. Number collection is also possible on the morning of the event at the RACE HQ but please collect in advance to save the rush on the day. We will NOT be posting out numbers again this year. If you cannot collect in the week prior please ensure you arrive at HQ in adequate time on race morning to allow collection of your number. Your number is disposable after the race – you do not need to return it. Do not allow anyone else to run using your race number. It is against UKA rules and could result in a medical emergency. If you do wish to transfer your number this can be done free of charge up until a week prior to the race. Email: twhalfmarathon@gmail.com. Remember NO NUMBER OR CHIP = NO TIME. You must wear the number pinned to the FRONT of your vest. It must not be folded or altered in any way. The timing chip provided is on your number. No number, chip and you may not get a time certainly not a chip time. Please write emergency contact details and any medical conditions on the reverse of your number. On the day enquires will be handled by our information desk on the day. Again please leave plenty of time for collection of your number. Race HQ opens at 7:00am and you should to be in the start pens by 8:45am to start the race which has to start promptly due to traffic management restrictions. We operate a free baggage drop at HQ where you can leave your belongings. Please use the issued baggage tag (affixed to your number) and fix it securely to your bag and leave sufficient time to drop your bag and get to the start approximately 5 mins walk away. Toilets are available at race HQ and in the finish area. Please use the toilet facilities in good time before the race start. Anybody seen urinating in residents’ gardens, especially those close to the start area, will be disqualified from the race. Pre/Post race massage is being provided, follow the signs in the HQ. Masseurs all provide their services free of charge. A donation of £5-10 is suggested which is donated to a charity chosen by the Masseurs. Last year over £200 was donated to the Pickering Centre in Tunbridge Wells. If you are medically unfit to run a half marathon due to illness or injury, then you should not take part in the race. Please see www.runnersmedicalresource.com for medical advice related to running. Provisional results will be posted in HQ immediately after the race. Full provisional race results are available here by Sunday evening or on the Nice Work web site. Postal results are not available. DO NOT FORGET TO ATTACH THE NUMBER TO THE FRONT OF YOUR VEST OR YOU MAY NOT GET A CHIP TIME. Race coverage will be published in the Times of Tunbridge Wells– don’t forget to get your copy! There will be an engraver in race HQ so if require your time name etc engraved at a cost of £5 please ask our engraver who will be present this year. It is possible as an option to purchase and iTab £8 which will be sent shortly after the race with your result and which can be attached to your medal. The Hendy Tunbridge Wells Half Marathon, Sunday 17th February 2019 starting at 9am. Welcome to our Half Marathon traffic management page. Whether you are visiting this page having seen one of our advance warning signs around the course, or are an interested competitor or spectator, we hope that we can explain what will be happening on the roads around Tunbridge Wells during our event. If you have any questions, please do not hesitate to contact us. In association with Kent Police and Kent County Council, we are putting in place a series of traffic management measures which will lead to certain junctions being closed or diversions instigated for a short period while the runners go past. Essential measures have been put in place to improve the safety of runners, drivers and race officials, and to improve the flow of traffic around the town during the event. Expect some disruption and delays between 09.00am – 12.00am. Some junctions will only be closed for 10 to 20 minutes, while others may be affected for up to 2 hours. Closures are, however, being kept to an absolute minimum to avoid disruption, but are essential for the safety of runners and drivers. The closures and diversions are detailed fully below. We hope that residents will make alternative travel arrangements if affected, and come to support the race and runners taking part in the town’s biggest mass-participation sporting event. 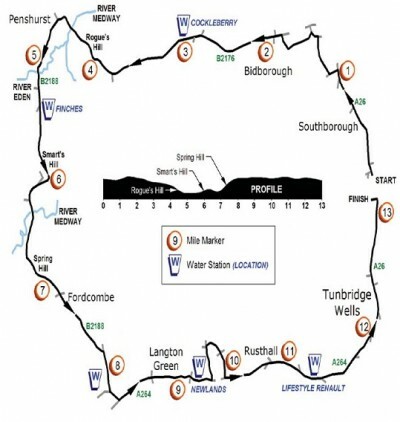 The course is a single lap anti-clockwise loop, starting and finishing in Southborough, and passing through Bidborough, Penshurst, Fordcombe, Langton Green and Tunbridge Wells. The southern section of the course is likely to be the most congested, and is detailed in this map. Northbound traffic will be stopped on the A26 St John’s Road to allow the race to start, and will be allowed to continue after about 10 minutes. Traffic will not be permitted to join the course from roads within the circuit while the main bulk of runners is passing, and will also not be allowed to turn into these side roads from the clockwise carriageway of the circuit. All closed roads will be clearly indicated by normal statutory signage, and will also be manned by race officials for the duration of the event. The A264 will be closed eastbound (towards Langton Green) at the junction with the B2188 Fordcombe Road. All eastbound traffic will be directed in a clockwise direction around the Half Marathon course along the B2188 to Penshurst, and then the B2176 to Bidborough. Access to Tunbridge Wells will then be via the A26 southbound through Southborough. There will be no restriction of access to the A264 westbound (towards East Grinstead) at the B2110 junction with the A264. Mount Ephraim will be closed to westbound traffic between the Grosvenor Road roundabout and the junction with the A26 London Road. Traffic will be diverted through the town centre to rejoin Mount Ephraim via Church Road along the following route: Grosvenor Road, Upper Grosvenor Road, Meadow Road, Goods Station Road, Mount Pleasant Road and Church Road. All diversions will be easy to follow, with the routes being indicated by normal statutory signage. Trophies and medals, cash / voucher and sponsor prizes (CustomfitBrands) will be given to all category winners (TBC). (Additionally there will be voucher for entries to the 2018 TW Half Marathon for 1st, 2nd and 3rd Male and Female overall). NOTE: In the case of a veteran runner winning an overall race prize, both prizes will be awarded to that runner. A runner may only win a prize in their OWN age category as well as an overall prize. Gun times (not chip times) will be used for all categories. Our huge thanks go out to ALL the sponsors and supporters of the 2018 ‘Hendy Health Tunbridge Wells Half Marathon’. Q: What is the race website address where I can find more information and more up to date announcements? A: This website (www.twharriers.org.uk) contains all of the up to date information on the Half Marathon page. Q: Who organises the race? A: The race is organised by volunteers from Tunbridge Wells Harriers. Q: When and where is the race being held? A: The Hendy Tunbridge Wells Half Marathon takes place on Sunday 18th February 2018 at 9.00am. This will be the 35th year of the event. Race HQ is the Sports Hall section of the Tunbridge Wells Sports Centre and the race start and finish are nearby. Q: When do entries open? A: Entries opened in September and will remain open until all places are taken or the closing date in mid-February 2018 is reached. A: Entries are open online until midday on 13th February 2018 (apart from complimentary places – see below). Q: How do I enter if I have a complimentary place? A: Contact the Race Organisers at twhalfmarathon@gmail.com if you have a complimentary place. You will be given more information on what to do. A: The entry costs are £24 affiliated or £26 non-affiliated until mid December when the price will increase to £26 affiliated and £28 non affiliated. There will be some entries on the day if the not sold out for £35 cash only. Q: When will I get my number and other entry information? A: As soon as you pay for the event you will receive a confirmation email. You will not receive your race number or other race paperwork, this will be available for collection in the week prior. Please retain your confirmation email as a reminder that you have entered. Q: Is it necessary to register on the day? A: No, further registration is not necessary after the initial entry application has been made. Q: What is the minimum age to enter the race? A: All competitors must be at least 17 years of age on 18th February 2018. There is no maximum age! Q: Do I need to be a club runner to enter this event? A: No, the race is open to affiliated club runners and non-club runners. Q: Are there other restrictions on entry? A: As this is a hilly course, we regret that it is not suitable for wheelchair athletes. Dogs or buggies are also not permitted, and runners must not be accompanied or followed by others on cycles. Additionally you should be able to complete the race in 3 hours max. Q: Can I enter on the day of the race? A: The race has sold out in advance over past years. This being the case there will be no entries on the day (if not sold out limited places may be available on the day at an extra cost). Q: How much running experience do I need to run this race? A: The race is open to all but individuals need to bear in mind that the course is 13.1 miles long and is undulating and in two particular parts, fairly steep and hilly. This particular half marathon is a fairly challenging course and runners should judge for themselves if they have run enough and are sufficiently trained for the event. Beginners are welcome but we ask that you do not walk or run the course if you do not expect to finish in under 3 hours. Q: Why is there a limit of 3 hours on the event? A: Firstly to ensure that those who enter are sufficiently fit enough to complete the event and secondly that we cannot keep roads closed for longer than this. Road closures are a necessary and important part of the event’s organisation but we do not wish to inconvenience road users for any longer than is absolutely necessary. Slower runners will therefore be directed to the pavement at Langton Green after approx. 2.5 hours. Q: Do you issue runners’ instructions? A: Yes, these are emailed to all runners before the event with any other essential information. A copy will also be available on the website for you to download. Q: Do I need to wear special kit? A: No, your normal running clothing is normally sufficient, but competitors should be mindful that the event could experience inclement conditions and dress accordingly. As a general piece of advice it is not advisable to run any race in new running shoes. The course is all on-road so normal running shoes only are required; there is no off-road element. Q: Do I need to wear my running club vest? A: If you have entered as an affiliated competitor you should wear your registered club vest. Q: Where do I pin my race number? A: Your race number should be pinned to the front of your running vest and must be visible throughout the race and especially at the start and finish. A: The safety of our runners is paramount and we ensure this by arranging partial road closures, marshalling the race in many positions around the course, providing first aid, arranging a quick and sophisticated communications system to call for emergency services as required, and by giving race instructions to all participants. Q: I have a medical condition, should I notify you of this? A: If your medical condition could influence any emergency treatment that you may need in the event of you feeling ill during the race, then you should tell us on your entry; complete the back of the race number as well with all the relevant details and advise in the appropriate section when you enter. If you are unsure of your fitness to run, please see www.runnersmedicalresource.com for medical advice related to running. Q: Am I allowed to run with a personal music player? A: Runners now cannot wear wear personal headphones/earphones to listen to iPods, MP3 players, smartphones or other personal music players while participating in this race. This is now a UKA Rule by which we are governed. Running whilst wearing headphones/earphones significantly reduces your ability to hear traffic, individual vehicles, instructions and warnings from the police, marshals and other people, and generally distracts your attention, increasing the risk of accident or injury to yourself and possibly other people. If despite this advice you choose to participate in the race using such a device and are asked to remove them but ignore you accept full responsibility for your own safety and for the safety of anyone else who may be affected by your acts or omissions. You may as a result be disqualified from the event not receive a finishing medal or completion time. A: The race is a 13.1 miles single lap testing course starting and finishing near the Tunbridge Wells Sports Centre. Full details of the course can be found here, but in summary the course goes through Southborough, Bidborough, Penshurst, Fordcombe, Langton Green and Tunbridge Wells. It is all on-road and there will be comprehensive road closures and other security measures in place. Q: Is the course distance accurate? A: Yes: it is the half marathon distance of 13 miles 192½ yards. The course has been measured by the IAAF recognised method of course measurement and has received a certificate of course accuracy from the Association of UK Course Measurers. Most runners realise the importance of having courses accurately measured in order to make comparisons of times sensible, and the recognised method of measurement ensures an accuracy of 10m in every 10km. This is more accurate than a car odometer and most GPS’s, and the method also adds a factor to ensure that the course is not short in order to make PBs and records possible. Q: Will there be pacers? A: Yes, there are plans to organise pace groups for sub 1.30, sub 1.40, sub 1.50, sub 2.00, sub 2.10 and sub 2.20. Due to the hilly nature of the course, the pace will vary and won’t be on ‘minute mile pace’. The start area will be marked with where to congregate for expected finish times; pacers will be easily identifiable. Q: Do I get a drink on the course? A: Yes, there will be at least 6 water stations on the course, including the finish. See the race website for exact locations. As the race is a half marathon all runners are encouraged to drink during the run whatever the weather. Q: Will photographs be taken of the race? A: Yes, www.sportcam.net will be taking photos of every runner and these are normally available for purchase from their website about three days after the event. Q: Will there be entertainment at the race? A: Yes, we always provide entertainment to make the event lively and fun as well as to encourage our runners. Please give them a cheer as you run past! Q: How soon will the results be made available? A: Race results are made available on the day; printed sheets are posted on the wall at Race HQ. Full race results and all relevant details will be available on the race website normally within 24 hours of the event and on the HS Sports website. Q: Can I find out the race results from previous years? A: See the race website for a link to the results from previous years. Q: Do I receive a medal for finishing the race? A: Yes, specially designed bespoke medals are given to all runners who complete the race as well as water and something to eat. One free technical t-shirt is also given to each runner; these can be collected before or after the race from Race HQ. Do not forget to collect on the day of the race as they cannot be sent to you after the race. A variety of sizes will be made available and these can be tried, queues and timing permitted. There will also be facilities to have your medal engraved with your time at Race HQ. A: Yes there are prizes for 1st male and female, 2nd male and female, 3rd male and female, age category prizes, and trophies to UKA affiliated clubs of 1st, overall male and female teams. Q: Is car parking available? A: Please note that there is no parking at Race HQ, only drop off. However a number of local schools and other organisations are kindly allowing us to use their facilities on race day (see map). Full details can be found in the race instructions and up to date information will also be posted on the website closer to race day. You need to download the parking map from the website which clearly states the permitted parking zones. Please do not park in front of residents drives and so on particularly along Reynolds Lane. Q: Are there toilets at the event? A: There will be plenty of toilets at Race HQ but none on the course. Please allow plenty of time to use the conveniences ahead of the race start to avoid last minute bunching of runners at the back of the start area. We allow one toilet for every 50 runners, plus additional urinals for the male runners. This is actually double the requirement of BARR recommendations. Please do use the toilets and allow plenty of time to do so, we will disqualify any runner seen urinating in residents gardens close to the start area. Q: Are there changing facilities at the event? A: Yes, there are male and female changing rooms at the Race HQ, St John’s Sport Centre but unfortunately the sports centre do not allow us to use their showers due to limited water supply and pressure on the heating system. However space is limited and it would be most helpful if non-runners stayed away from the changing areas. Supporters can use the separate toilets also located at St John’s Sports Centre. Q: Is there a bag drop facility? A: Yes there is a supervised bag drop facility at race HQ. Ensure you remember to tag your baggage with your race number on it. Please only drop one bag per runner. Please allow plenty of time to use the bag drop facility, there is always a queue and it is not advisable to hang on to your belongings to the last possible moment. Q: Will there be refreshments available? A: Yes, there will be a variety of refreshment providers at Race HQ for use by runners and supporters. Q: Will there be massage available at Race HQ? A: Yes, the service will be free, but a suggested donation of £5 will go to the race charities. Q: Will there be childcare available? A: Unfortunately there will be no child care this year due to refurbishment work at the Sports Centre. Q: Can I withdraw from the race? A: Yes you can but we are unable to give refunds as the financing of the race is based on the total number of runners that we can accommodate on the course. As all our surplus funds are donated to charity we cannot issue refunds. It is your choice to run or not once you have entered but we are unable to refund the entry fee if you withdraw. Q: Can I transfer my entry to somebody if I withdraw from the race? A: Under NO circumstances can race numbers be transferred to another runner without the organisers knowledge. There are two very good reasons for this. Firstly, and most importantly, for health and safety reasons. If a runner is injured or falls ill during a race we will have the wrong personal details for them. Secondly, the runner’s result and position in the race will not be a true reflection of their ability and can seriously skew the final results. In 2011 we disqualified a male runner who had used a race number of a female friend, finishing the race placed as 4th female. Clearly, this is unacceptable. However we are able to offer some flexibility here and will allow transfers for injured runners only; these must be complete by 13th February 2019. No transfers will be allowed after midnight on that day. Contact the Race Organisers on twhalfmarathon@gmail.com if you need to effect a transfer due to injury; you will be given more information on what to do. Q: If I withdraw from the race can I transfer my entry to 2019 or any other future event? A: No. The financing for each race is separate and so we cannot allow transfers between events. A: The title sponsor for the 2019 race is Hendy in Tunbridge Wells who we are very proud to be associated with. The details of other sponsors will be made available on the race website and in the race instructions. Q: Why are sponsors necessary? A: Without race sponsors the entry fee would be significantly higher and there would not be medals and other items that we are able to give to deserving runners. The costs of staging this race event, like all others, are very high (over £28,000) and so the significant sums given by sponsors enable us to price the event for runners at a more sensible level. Q: Which charities are being supported? A: Runners can enter and run on behalf of any charity they choose but the proceeds from this race will be donated to The Pickering Centre, Counselling Centre TW (www.thecounsellingcentre.org.uk), Bridge Trust (www.thebridgetrust.org.uk), Citizens Advice Bureau (www.citizensadvice.org.uk/tunbridgewellscab) You may like to consider raising funds for our chosen charity through your own additional sponsorship. If you raise money for charity you may only do so through sponsorship, there are a number of very useful websites through which you can request sponsorship from friends and family. Other forms of raising money are not encouraged, for example rattling a bucket round Race HQ or on the course. Q: Can I bring supporters to the event? A: Of course, we welcome as much support as possible and there is plenty of space at the start and finish area for enthusiastic support as well as the designated ‘spectator spot’ at Lifestyle, Langton Road, Tunbridge Wells where there will be a great atmosphere. Much of the on-road event however, is on country lanes where there are no pavements and so supporters are discouraged to stand around in these areas for their own safety as well as that of the runners. 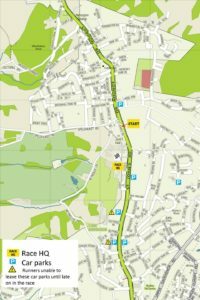 Apart from the start / finish area there is plenty of supporting space in Southborough, parts of Bidborough, Penshurst Village, Fordcombe Village, Langton Green Village and Tunbridge Wells Town Centre. In terms of your supporters getting to their chosen vantage points please note that due to traffic conditions, vehicular access to the course is only possible in a clockwise direction around the race circuit – see the race website for full details. Q: What is the weather forecast for the event? A: Please check on-line weather forecasts closer to race day and the race website in case of cancellation due to adverse weather. Q: How will I be notified if the race is cancelled? A: In the unlikely event that the race is cancelled ahead of race day an announcement will be made on the race website and as far as possible runners will be notified on an individual basis through emails, texts and local press. If the race is cancelled on race day the only way of notification will be through the race website. We will keep you up to date via a series of emails and messages on the run up to the race. A: In the case of abandonment or cancellation of the race by reason of unusually bad weather, the impossibility or danger of allowing the race to proceed, compliance with legal, police, or other public authority requirements or advice, or other exceptional circumstances outside the control of Tunbridge Wells Harriers and /or considered by the Race Director or Race Referee in their sole discretion to be sufficient, runners will not be entitled to the return of entry fee or any refund. Any net surplus made by the race is passed on to charity. Q: My question has not been answered, where do I go now? There are many places along the route from which to support the runners, and we have a number of bands playing for your entertainment. Some good viewing points are listed below. All timings are approximate. Please be aware of road closures and plan your viewing accordingly! The Race HQ is in the Sports Hall of Fusion Tunbridge Wells Sports Centre, St John’s Road. The Race Expo is in the hall, where runners can visit our sponsors and partners for discounts, offers and advice. The race start is further north along St John’s Road – race marshals will guide you on the day. Runners will pass this area between 9:03 and 9:20. The first runner should pass here at 9.25, with the majority through by 10.00 and the last runner by 10.20. 3 New Orleans Echoes jazz band will be playing at Penshurst again to jolly the runners on their way as they near the 5 mile point. The first runner should pass here at 9.35, with the majority through by 10.20 and the last runner by 11.00. This is the toughest section of the course and the runners need your support! Cheer the runners on from outside the Chafford Arms. The first runner should pass The Hare at 9.45, with the majority through by 10.40 and the last runner by 11.20. This is a pleasant open area where children can run around and there are a few benches for spectators to sit on. The first runner should pass here just before 10.00, with the majority through by 11.20 and the last runner by 12.15. Outside the Royal Wells, the first runner should pass here at 10.00, with the majority through by 11.20 and the last runner by 12.15. The Tunbridge Wells Ukelele Night will once again be entertaining runners on The Royal Wells Forecourt with their fab set list! Fuggles Beer Cafe will be providing every runner with a drink to help finish off the race between 08.00 and 12.00! The first runner will have to get to the finish by 10.04 (and 15 seconds!) to break the course record. The runners need lots of support along the last mile on St John’s Road, all the way up to the finish at Tunbridge Wells Grammar School for Boys. There are several cafés, bars and shops along this stretch of the course. Fuggles Beer Café 28 Grosvenor Road, Tunbridge Wells, TN1 2AP www.fugglesbeercafe.co.uk Fuggles Beer Mile – Free Beer! !